We feel honored and grateful that Tim took the time to share his personal experience live on the air. Welcome everybody. You are listening to KTST FM Anaheim.com radio. Timothy Daniels with you. We are streaming coast to coast and around the world. We are a stones throw away from Disneyland. So I wanted to talk about a fantastic experience I had earlier this week. We decided that we needed to get a new mattress. Buying a new mattress can be like buying a new car as there are a lot of choices and a lot of places to go. Where do you go, who do you go see, what’s your budget, what kind of mattress do you need to get, there are all different kinds of Mattresses. So I did some research, and I looked around, wasn’t sure which direction we were gonna go because the wife wasn’t sleeping so well, so we knew we needed to make a change. So I found online a place called Slumber n Serenity Discount Mattress and Furniture in Anaheim Orange county Ca. and I want you listeners to take note of this name and write it down. 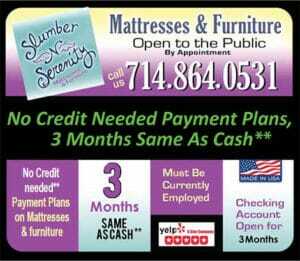 Slumber n Serenity Discount Mattress and Furniture. You’re gonna wanna call Vince and Stacy and talk to them. They are going to give you a great deal. In fact, before I talk any further Vince, if you’re listening, I know we talked a little bit about Rush the other day. I’m going to play some Rush, and when I come back I’m going to talk about Slumber n Serenity Discount Mattress and Furniture. Everybody hang on a little bit, here’s some Rush, this is for you, Vince. Timothy Daniels, KTST-FM Anaheim.com. So let me go ahead and talk about the mattress that we got. We went over here to Slumber n Serenity Discount Mattress and Furniture. It’s a discount wholesale mattress and furniture place and they offer the best pricing in Orange County. In fact, they can do it because they have a low, low overhead. They don’t have a giant box store. They have a small little showroom. You go in there, they have their Mattresses on display and you can go and check out the Mattresses. You can go in there, Vince will greet you and he says, “ok so what are you looking for”, “how’s your sleeping habit”, “what’s going on” and they get to know you and find out about you personally and find out what are your best needs, what’s going to be the best mattress for you. Maybe you need a firm mattress, maybe you need a soft mattress that has some memory foam in it or something. Maybe you need a different kind of mattress. They’re very knowledgeable in what is going to be best for you. And you’re going to pay a fraction of the cost. Imagine going in and shopping for a mattress, and let’s say you want to get the greatest, a new latex mattress, those are fantastic Mattresses and very well made. But maybe you can’t afford three thousand dollars. Well, you’re not going to pay that at Slumber n Serenity Discount Mattress and Furniture. In fact if you have a pencil and paper right now please write down this number. 714-864-0531. That’s 714-864-0531. Give Vince and Stacy a call right now. You can go down there and take a look at the Mattresses they have. No pressure at all. If you want to buy the cheapest mattress you’re going to make them just as happy as if you bought any other mattress. They are there to work with you and for you. They are a wonderful couple, very nice people, very down to earth and you’re going to have nothing other than a wonderful experience. “Since I can’t drive on the freeway anymore, I have trouble seeing the signs, Gloria and Judith told me they’d take me there. The three of us went the next morning. The girl Stacey knew we were going to be there by 10am, and we got lost and were a little later than we thought. But they were very understanding, we called them 10 times asking for directions. Low and behold we were right accross the street from them, and a nice young man made his way running accross the intersection to our car and helped us to their store. It was a smaller store, but very well decorated and clean. I spent about an hour trying the different mattresses, and the young man helped me from mattress to mattress. He was polite and helpful. I found the a good supportive mattress, oh so comfortable and the young man loaded it in a truck while I was paying and followed us home. I didn’t know how he was going to get it in around some of the clutter I have in my home, but he did, and he made it look easy. I only paid much less than what I thought I’d have to, and they wouldn’t take any more money to bring it to me. When I tried to tip the young man because of the discount they game me, he thanked me and told me to keep it for my next bridge game. “I purchased an internet special on Groupon for a hotel collection memory foam mattress. i was desperately in need of a new queen mattress, and I love memory foam as I seem to get the best sleep on it. “You have no idea how happy we are with Vince and Stacy at Slumber n Serenity. These folks care about their customers and make sure that they are satisfied from the moment they walk in to after the sale. The prices are amazing for the quality of mattresses and their great service. “I was traveling a few months back, and spent the night in a hotel where I literally got one of the best night’s sleep I’ve had in a very long time. I thought maybe I was just tired from travelling and that’s why I had slept so well. The second night I slept even better than the first night. When I returned home, I went back to my same old tossing and turning, and not really feeling rested in the morning. I looked up the number for the hotel I stayed in, called and asked what brand of mattresses they had in their hotel. They gave me a phone number for Slumber N Serenity, and told me to ask for their custom made hotel collection.